I’m happy to write this article during an incredible time of the year – a time when nations around the world compete in the Olympic Games. As I look at the medal count and see who’s leading from all these amazing countries, it’s exciting to know that SQA has a huge presence in each of them. Because of this, I’m cheering for all of the incredible athletes! This newsletter is going to be a bit different from the newsletters I have written over the last few years. I will still talk about Wins and Challenges, but I am adding a new area where I will bring up questions for you. Over the years, I’ve heard innovative ideas from clients and Associates all around the world, and frankly, I would love to see more feedback on areas where our company can improve – so I’m asking for feedback and hoping my little experiment will work! I’m so excited to announce the appointment of a new member of our Business Development team! One of our Field Engineering Directors, Dwayne Elkins, referred Emi to us and she started in early February. A key part of SQA hitting our 2018 revenue goal is finding people like Emi around the country. As Senior Director of Strategic Business Development, Emi is a proven professional who is ready to take us to the next level. Emi brings a wealth of knowledge and experience in strategic development, manufacturing, and consulting, with an MBA in International Business and a LEAN Six Sigma Black Belt. If you’re on the other end of a call with Emi, please welcome her to the team! Good luck, Emi! One thing we’ve been trying to do for some time is get together with our Associates in a roundtable format to share more ideas, discuss our global strategy, and learn about new opportunities around the world. In January, our inaugural SQA Associate 360/365 event was led by Jennifer Dukesherer and was joined by 10 key Associates from around the world. The program is designed to amplify outreach, improve engagement, and reinforce a better understanding of SQA. These fun and interactive video sessions will be held on the last Tuesday of the month with Associates from around the world, and they will include various guests from SQA Headquarters. This program is super exciting and will no doubt improve our overall client and Associate experience in 2018 and beyond! Our original goal of putting 100 US Veterans to work over the course of 2017-18 is being blown away! Our Associate Development Team along with Tim Reid, who is focusing solely on this initiative, can all be proud of putting these amazing people, who are so deserving after all they’ve done for our country, to work. See below for the full update, and please refer any Veterans you know to us! Our employees are simply awesome. 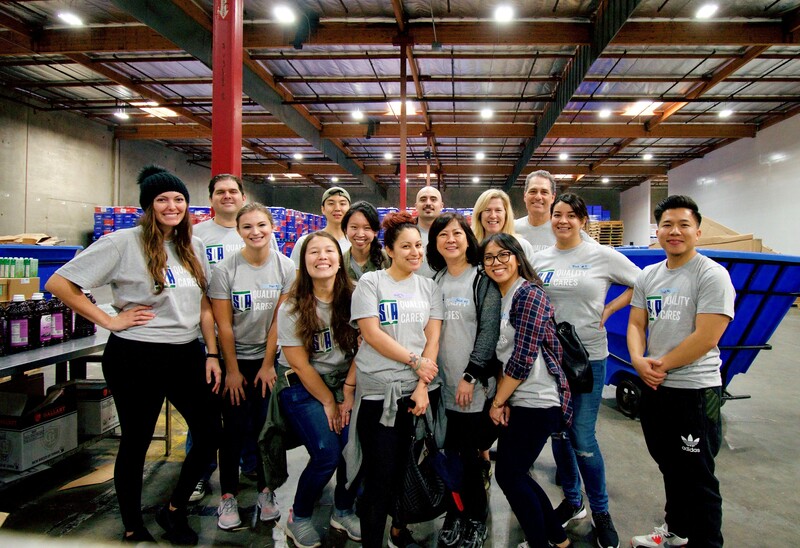 A few weeks ago, we had 14 SQA-ers volunteer at the Los Angeles Regional Food Bank. The shirts they wore said it all: “Quality Cares.” At SQA, we care and want to make a difference in our community. Please let us know if you are involved in similar programs nationwide, and we’ll send you a shirt! It’s always fun to talk about where we are thriving, but equally important is balancing out the discussion with areas where we can improve. This is where I get amazing feedback after every article, so please keep sending me your ideas! We have more than 100 active clients, and most operate differently when it comes to budgeting, invoicing, forecasting, and monitoring to stay on top of things and avoid surprises. At SQA, we always strive to provide “hyper service” – when a client says, “Jump,” we say, “How high?” This attribute doesn’t always help us. Although clients love this responsiveness, on-demand service costs can quickly add up – sometimes taking a client by surprise. We are now implementing new procedures to alleviate this risk as much as possible. We are slowing things down at the most critical times, asking more questions, and providing more metrics and budget scenarios before ramping up our team to levels that put stress on client costing models. This has been a challenge I’ve written about before, and it understandably keeps pace with SQA’s growth. Many of our clients are enjoying pricing from several years ago, and we are going to need to revisit these parameters over the course of 2018 to fully achieve a win-win for all parties, including our Associates. The costs of IT security, labor, and travel are way above CPI, and we’re brainstorming about the best ways to adjust things moving forward. Bringing up price increases with clients is a delicate matter, but we need to act in this area to balance and align things – including making sure our Associates are fairly rewarded. Many of our clients outsource to us so that they don’t have to deal with these subjects, but the underlying factors remain. It’s a tricky subject, but we try to help our clients understand where we are coming from and spread changes over a longer period of time to reduce surprises and help clients budget accordingly. Please think about these questions and send any and all feedback to me at mmckay@sqaservices.com. Getting our clients to align their busy schedules has been a challenge, and it’s hurting our Quality Exchange (QX) events. Those who attend are important figures in the quality world, and they are constantly in demand. We’ve had to postpone our last two sessions due to a number of conflicts and emergencies. Should we take our show on the road and make it easier for clients traveling from afar? Or should we continue to have our meetings here in (usually) sunny California? What would make you attend? We are always looking for new programs and projects, and we work really well with our usual client contacts. However, several of our largest opportunities over the last few years were referred by Associates or by Client contacts who weren’t on our radar. How can we do a better job of spotting these opportunities across our client landscape and across the industry? Are you seeing any opportunities out there we should know about? How can we help Associates out there who are tremendously qualified but simply live in an area where we have less going on? We want to put them to work! Are there Associates out there, with their own network in the world of quality people, who would match their contacts to our open job opportunities, or recruit for us on assignments around the world? What other ways can we offer training/orientation for our auditing Associates in order to facilitate a smooth alignment with client requirements? Are you seeing or involved in any interesting quality industry trends or developments that you would like to report? These are just a few questions that I am hoping will generate some creative replies. Thanks for reading and thanks for your continued support! Did you know that one in seven people in Los Angeles County struggles with hunger? Members of Team SQA volunteered at the Los Angeles Regional Food Bank in Commerce, CA, where together we packaged more than 6,500 meal kits for senior citizens! We had a great time showing just how much #QualityCares. 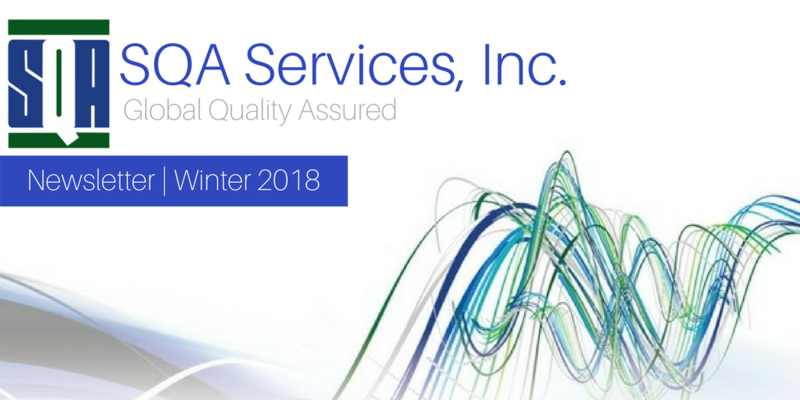 SQA exhibited at the American Aerospace & Defense Summit in early December, where Field Engineering Director, Jason Anderson, led a roundtable discussion on moving from first article inspection (FAI) to advanced product quality planning (APQP) in Aerospace. 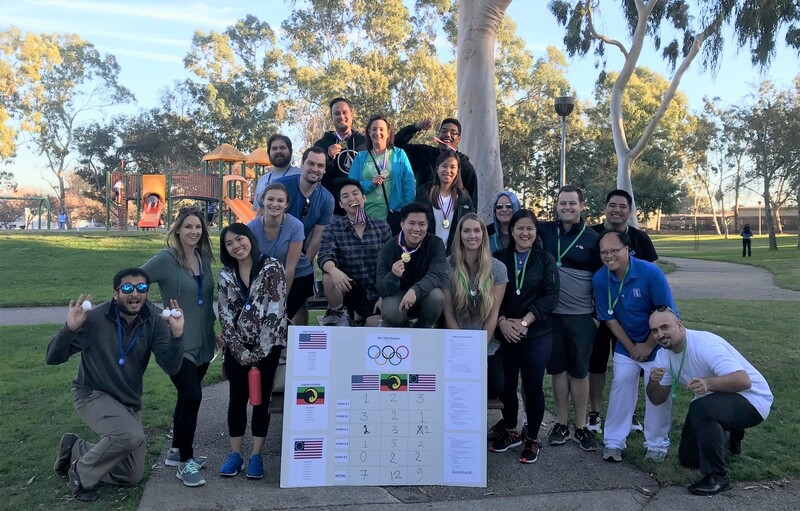 Team SQA had a great time at our first ever SQA Olympics! There were five events held that required teamwork, communication, and resourcefulness. Congrats to our gold, silver, and bronze medal winners! 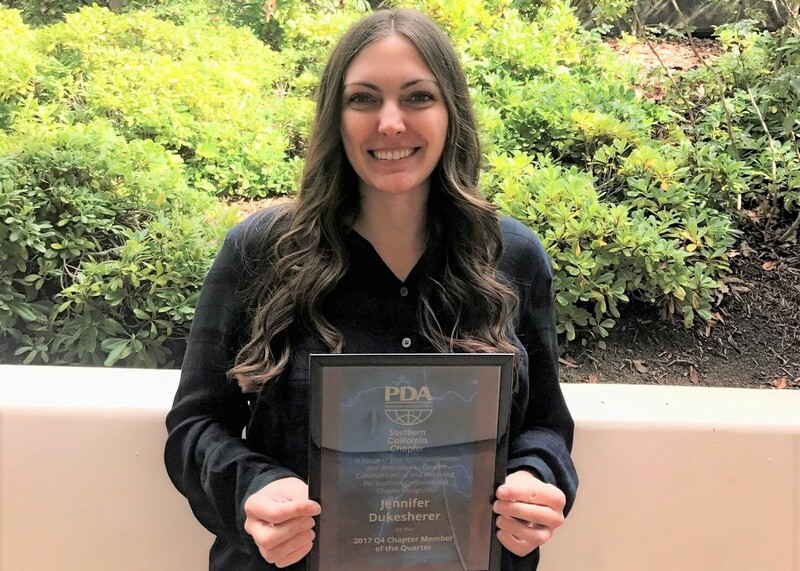 Jennifer Dukesherer, Communication Specialist here at SQA, was named the PDA Southern California “Chapter Member of the Quarter” for Q4 2017. Jennifer has been assisting the SoCal PDA’s Board of Directors with Chapter communications, marketing, and social media. Way to go, Jennifer! We always look forward to visits with our Associates in person! 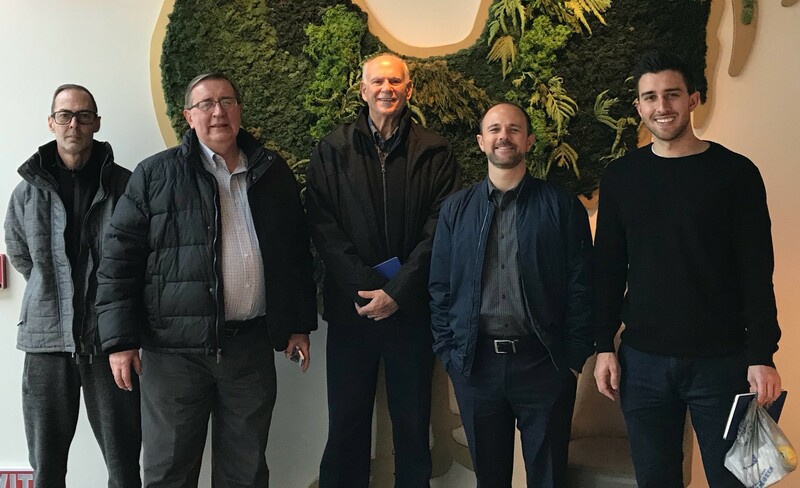 Nick Healy, Director of Operations, and Justin Quattrone, Program Manager, enjoyed meeting three SQA Associates in Pennsylvania in mid-January. Likewise, if you are ever in the Los Angeles area, please let us know! Team SQA had the pleasure of touring the Long Beach Container Terminal (LBCT) with ISM Los Angeles, where we saw the importance of quality and efficiency to an operation, firsthand. The SQA team will be attending and exhibiting at the following events. We would love to see you there! The next 2018 Quality Exchange will be held in Los Angeles from April 26 to 27. Look out for posts with #SQAQX for updates and more information. Our Marketing Team worked hard on a beautiful calendar with a quality theme for each month of the year. 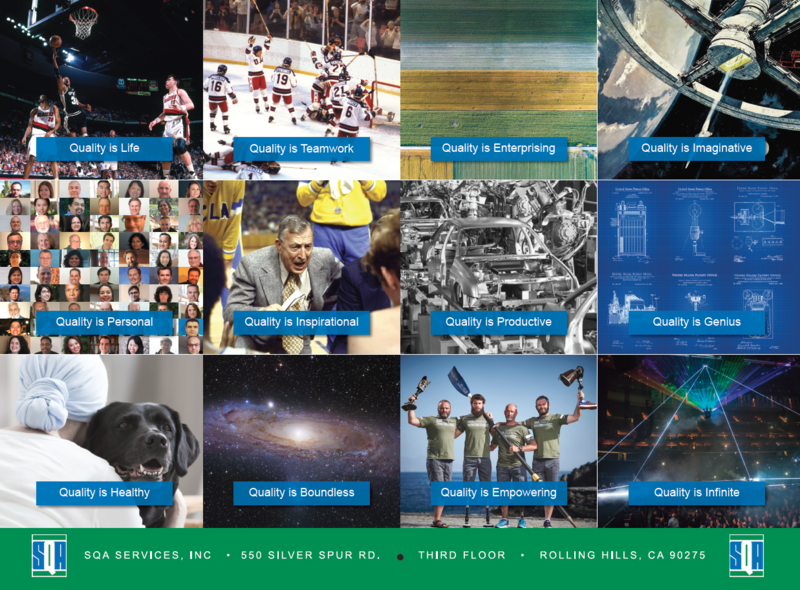 Each theme shows how SQA plays a vital role in the products and services we touch every day. Please reach out if you would like a hard copy, and we’ll be happy to ship one your way! You can also download the digital version from the resources page on our website. SQA has made great strides with our goal to put 100 veterans to work. Thanks to our Associate Development Department that is leading the charge, SQA has put 37 Veterans to work to date! I am a firm believer that self-improvement is one of the keys to success, both personally and professionally. This ideology is also shared amongst the Program Managers at SQA, as one of our Program Management themes for 2018 is “Professional Development.” I received my CQIA (Certified Quality Improvement Associate) certification a few years back and decided it was time to hit the books again for another. 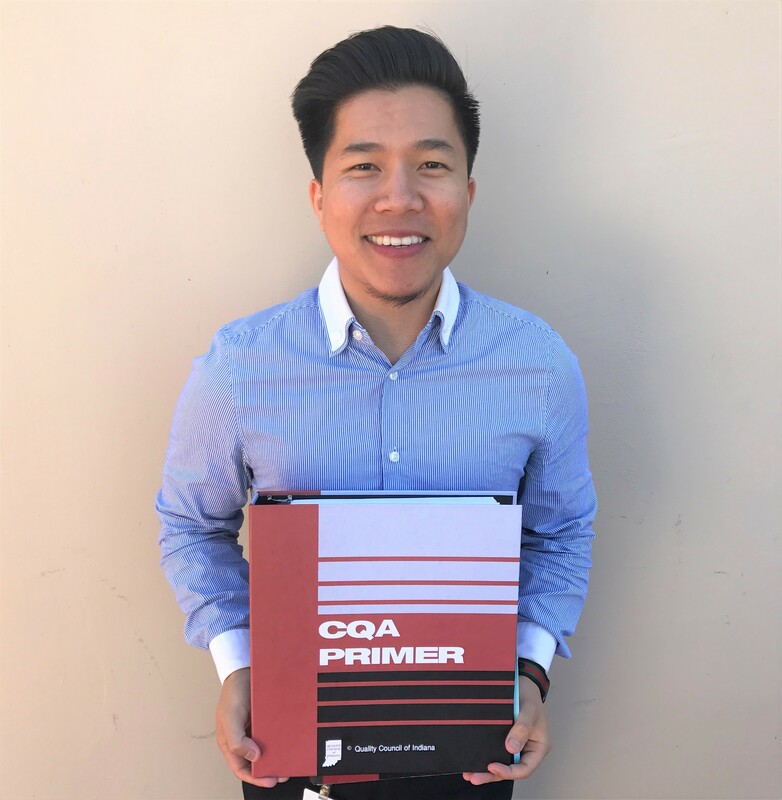 The CQA (Certified Quality Auditor) certification stood out to me because I saw it as an opportunity to refine my knowledge of the auditing function as a whole. Studying for the exam opened my eyes to the different auditing techniques, tools, and methodologies that our SQA auditors employ out in the field each and every day. ASQ provides a catalog of different certifications to choose from, and I encourage everyone to go check them out. Now, on to the next certification! Hi! I am Tim Morris, an associate of SQA Services working as a Safety and Mission Assurance (SMA) representative of NASA for the Joint Polar Satellite System (JPSS) program, specifically supporting the Cross-track Infrared Sounder (CrIS) instrument. This challenging opportunity takes me around to several suppliers of assemblies and components for the instrument, with trips to places like Quebec City in Canada; Tampa, Florida; Phoenix, Arizona; Little Rock, Arkansas; Reno, Nevada; and many more. The history and people in all of the places I am able to visit is fascinating — meeting these people and witnessing the evolution of technologies to support the challenges of space and the increasing need for weather trending makes each day a great learning experience. I have been contracted through SQA Services since January 2011, resulting in more than seven years of association. In all interactions, the people of SQA have been both professional and friendly. This position with NASA has challenged my flexibility and adaptability, with the required travel and workload. Throughout all this, SQA has been an advocate for me and when I need help, I get it. I am contracted by SQA from my own business, where I provide concierge System Engineering services for the small business community. When I’m not working, I have many different hobbies, including camping and exploring both urban and rural environments. There is so much to see and do, there isn’t enough time to enjoy it all, and fortunately for me, this is true on the work side of my life as well.